Personalized heart shape chrome metal holder keychain bridal shower favors offers larger space for imprinting your name or initials. You can give this heavyweight heart shaped chrome metal holder towards the end of celebrations. Your guests would feel pride in displaying it wherever they go. This way you are spreading word about your relationship and trying to remain closer to ones you love. Perfected to sizzle, these metal holder keychains can be sought for individual and complementary gifting. 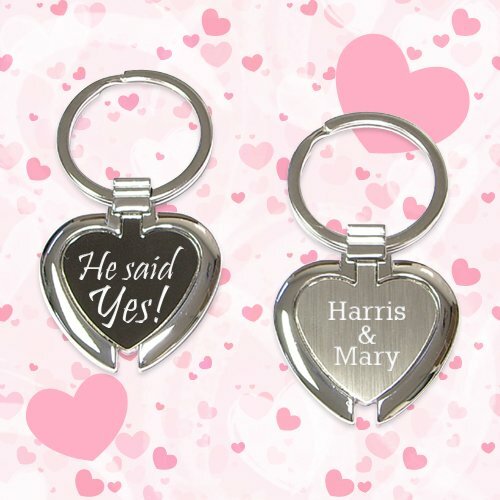 Request a quote to know wholesale savings for custom wedding heart shape chrome metal holder keychains. Product Size : 1 1/2" x 2 5/8"